Exercise full control over privileged sessions and remote access across your *nix infrastructure. Simply use this free add-on to enable a connection through Netwrix Auditor’s RESTful API, and start collecting data from your Linux, Unix, BSD and Mac OS-based devices today. 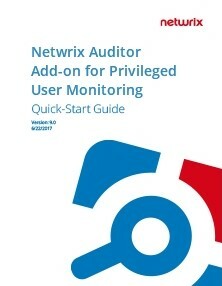 This add-on works only in combination with Netwrix Auditor, so make sure you have Netwrix Auditor installed. Stay in complete control of what users who run SUDO commands are doing. The actionable information includes who-what-when-where details, so you can promptly detect and respond to improper behavior performed using privileged accounts, as well as failed attempts at privilege elevation. Improve user accountability, data security and operational stability by gaining complete visibility into user logons, session starts and ends in your critical Unix-like systems performed by anyone using an OpenSSH remote connection. Easily aggregate data into a single audit trail for simplified analysis, and keep that trail for as long as needed in a reliable, two-tiered storage that allows quick access to activity records during security and compliance investigations. Want more help getting started with the add-on? Read the Quick-Start Guide. Want more help getting started with the add-on? Review detailed instructions for installing the Add-on for Privileged User Monitoring on Linux and Unix Systems. Learn how to configure the add-on properly. Start getting complete visibility into targeted, one-time privilege elevation activities and OpenSSH remote connections across your Linux and Unix environment.